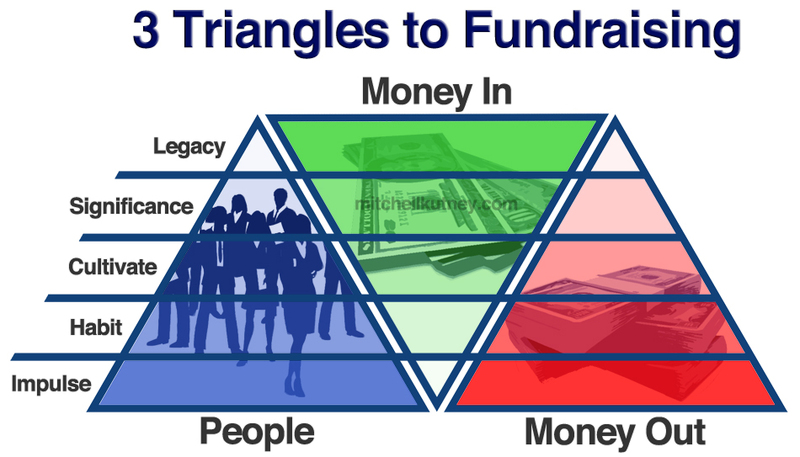 Money lives with people, thus in order to raise funds for your organization, you will need to raise donors. Before you can do this, you need to demonstrate creditability. A common way to demonstrate credibility is by partnering with others who have already established themselves in the community. Then, if you can write a compelling proposal to get your idea off the ground, and have brought all the right people to the table, your next step will be to raise the resources (fundraising) necessary to sustain your program or organization. Fundraising can be separated into five levels (Impulse, Habit, Cultivate, Significance & Legacy), which represent the commitment of donors. This commitment will determine the cost of fundraising (the fundraising burden) that must be borne, and the effect of uncertainty on the amount raised. The fundraising burden cannot be driven to zero, and attempts to reduce this cost below a reasonable threshold is a [tooltip text=”A false economy is an action that saves money at the beginning but which, over a longer period of time, results in more money being spent or wasted than being saved.”]false economy[/tooltip]; however, it should be the goal of any non-profit to minimize the fundraising burden, allowing the maximum proportion of funds raised to go towards achieving your intended objectives. Forget the negative connotations associated with impulses. When you initially ask someone for a donation, they will often give on the basis of human impulse, and there is nothing wrong with this approach. This strategy is used a lot with charity-corporation partnerships; for example, where a cashier will ask if you want to make a donation during the purchase of goods. However, connecting with people is expensive, and in the first stage of fundraising, it costs a lot of money to reach your potential donors with little return; do not get discouraged. The most important attribute of the impulse stage is the ‘ask.’ If you do not ask, you will not receive; so it is important to ask as many people as you can. It is also important that, if at all possible, to collect the names and contact information of people who have made donations, to thank them and to establish them as habitual donors. This growing database of new donors will serve multiple purposes throughout your fundraising campaign. Donors up to this point have given on the basis of impulse. Of the people that did provide a donation, there is the potential they will give again on the basis of habit. If they gave last year, chances are they may be willing to give again. Moreover, it will cost less money to connect with these individuals as you already have their contact information. However, not everyone will give again and their donations will likely be similar in size. This is because these donors are still not connected to your organization on any authentic level yet. At this stage your goal is to transform your donors into philanthropists. Initially, people gave money on the basis of impulse and then habit, but they were not engaged, they were individuals who could afford to support your cause, and did so because you asked. This level of donations will form the bulk of your stable funding; they believe in your cause and they should never be neglected. Remember, these individuals already donated to your organization twice before, if you are going back to them for a third time, you will need more than merely [tooltip text=”Mental short cuts to ease the cognitive load of making a decision.”]heuristics[/tooltip], in fact you will need to intimately involve them in the cause they are supporting. This will add some costs that were not a part of the former stages, however the donations will be bigger because the donors are much more connected to where their money is being used. Imagine that you initially asked 10,000 people to support your cause or nonprofit, the donors who will remain with you at this stage will probably number less than ten. These are the individuals that have both the net-worth to support your organization, and truly believe in the (now shared) cause. These individuals are more than donors, and more than philanthropists; they are stakeholders now. The costs to work with these individuals are much lower because they know you and you know them. Moreover, the donations these individuals make are significant. These donations will not necessarily be made on the annual basis, such as by your cultivated donors, but will be special gifts that should be strategically solicited. This can be seen as the final stage of fundraising, which is the rarest and most personal level of commitment. The donor identifies with your organization and wishes to see it prosper as part of their personal legacy. At this point a donor and the organization have had a long-term relationship, and the donor wishes to include the organization in their will. This stage has the fewest people involved, and costs the least amount of money to raise with the highest returns to the organization. It is important to understand fundraising principles because it is necessary to sustain any nonprofit/charity in the long-term. While the government is an important partner, their funding is unstable, and is more often than not, a one-time grant. Nonprofits and charities need to leverage government grants to kick-start their fundraising campaign, but should not rely on them in the long-term. Fundraising is one of the few autonomous solutions for sustainability, and should always be a primary focus. However, as this article has shown, the focus should not be on money, but rather on the people. This article was co-authored by Mitchell Kutney and Albert Thibodeau. Both Mitchell and Albert are co-founders of JustChange Inc., a micro-granting organization in Ottawa.